At a time when most public employee retirement funds have huge debts, a court decision has resulted in a $7 billion reserve for a CalSTRS inflation-protection account expected to spend $269 million this fiscal year. The Supplemental Benefit Maintenance Account makes payments needed to keep the pensions of CalSTRS retirees from falling below 85 percent of their original purchasing power. The California State Teachers Retirement System gives retirees an annual 2 percent increase, based on the original pension payment and not compounded. But the cost-of-living adjustment has not kept pace with inflation in recent decades. This fiscal year 24 percent of CalSTRS benefit recipients (59,996 persons who generally began receiving pensions in 1990 or earlier) are expected to receive a total of $269 million to keep their pensions at 85 percent of the original purchasing power. 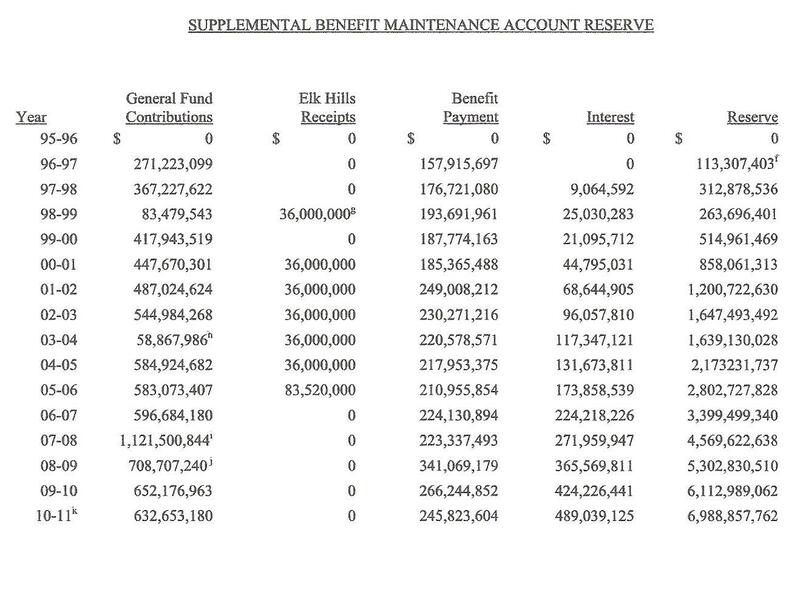 The special fund that makes the inflation-protection payment not only has a $7 billion reserve now, but money continues to pour into the Supplemental Benefit Maintenance Account, rapidly increasing the size of the reserve. The special account gets about half of the $1.3 billion state contribution to CalSTRS this fiscal year. The other half goes to the seriously underfunded CalSTRS pension fund, which has a $56 billion long-term debt or unfunded liability. Moreover, the interest earned by the $7 billion reserve, $489 million last fiscal year, is nearly twice the amount needed for the annual inflation-protection payment. The interest is growing at a pace that may soon surpass the state contribution to the account. A secondary provision in a pension-boosting bill, AB 1102 in 1998, made the state contribution to the special account, 2.5 percent of teacher pay, a “vested” right protected by contract law. That means the state must continue to make an annual payment equal to 2.5 percent of teacher pay, now more than $600 million, into a special account with a reserve far in excess of the amount needed for its annual expenses. As lawmakers learned the hard way, the courts have been ruling that “vested” pension rights are protected by contract law and not easily cut. During a budget crunch in 2003, the state cut $500 million from its payment to the inflation-protection account when the reserve was $1.6 billion. The CalSTRS board filed a lawsuit and won repayment. The state made an initial repayment of $500 million to the special account in September 2007. Now the state is paying off the remaining principal and interest with $70 million annual installments, the last one scheduled next fiscal year. Meanwhile, the unvested state contribution to the CalSTRS pension fund, which was 4.3 percent of teacher pay in 1998, was cut by legislation and dropped to 2 percent of teacher pay. Most of the CalSTRS contributions come from teachers, 8 percent of pay, and school districts and other employers, 8.25 percent of pay. An actuarial report showed that as of June 30 last year, the CalSTRS pension fund was 61 percent funded. An additional annual contribution of 14 percent of pay, nearly $4 billion, would be needed for 100 percent funding over the next 30 years. The CalSTRS investment fund, recently worth $154 billion, had strong earnings in the fiscal year ending last month, up 22 percent. But the fund, which plunged to $112 billion in March 2009, is still short of its $180 billion peak in October 2007. Unlike most California public pension systems, the CalSTRS board lacks the power to set the annual contribution rate that must be paid by employers, needing legislation instead. Two key points in the CalSTRS message to lawmakers: 1) Investment earnings will not close the funding gap. 2) The amount of the contribution increase needed for full funding grows with delay. So, would the $7 billion in the special-account reserve, and the $600 million annual state contribution to the account, be better spent if much of the money was shifted to the troubled CalSTRS pension fund? Or during this era of deep state budget cuts, when school spending has been slashed, why not tap the unused $7 billion reserve for a multi-billion dollar loan that could ease some of the painful reductions in education or health and welfare programs? The provision in the 1998 bill vesting the state contribution to the special account at 2.5 percent of pay can look like a blunder, at best a drafting error. The bill could have protected retirees by guaranteeing that pensions would not drop to less than 75 percent of their original purchasing power (later increased to 85 percent, the current minimum). Lawmakers would have retained budget flexibility, the ability to respond to changing circumstances. The state would have avoided the apparent absurdity, not to mention inequity, of pouring money into a giant unused reserve during hard times. But the vesting bill was enacted during good times, part of a legislative package in 1998 that increased teacher pension benefits, while cutting state contributions to the pension fund. The CalSTRS funding level, about 30 percent in the 1970s, was nearing 100 percent. Legislation a decade earlier had increased contributions to the system, and investment earnings soared during a high-tech boom. Lawmakers wanted to use the apparent new wealth to increase the pensions for teachers, which were said to be lagging other public retirement systems, and give teachers with long service and experience an incentive to work longer. Top billing in the vesting bill went to provisions that boosted pensions. Unused sick leave was allowed to be counted as service credit. The pension formula was increased for teachers with 30 or more years of service. The vesting bill and another pension-boosting bill were linked to a third bill that a legislative analysis said “contains the funding component of the package.“ AB 2804 lowered the state CalSTRS contribution, saving $1.4 billion over seven years. Now some CalSTRS officials regard the ironclad inflation-protection account as one of the good things that emerged from the good times more than a decade ago. In their view, the big reserve is not excessive because the billions could be used up fairly quickly if inflation increases, particularly to the double-digit level of the late 1970s. The funding stream from the state general fund into the inflation-protection account is indeed vested. But inflation-protection payments to retirees are not vested if the account does not have enough money to make the payments. Therefore, at a time when most public retirement systems are seriously underfunded, including the CalSTRS pension fund, the inflation-protection account is a welcome exception with a healthy cushion to protect retirees in the future. This entry was posted on July 13, 2011 at 7:18 am and is filed under CalSTRS, Funding gap, Operations. You can follow any responses to this entry through the RSS 2.0 feed. You can skip to the end and leave a response. Pinging is currently not allowed. The CalSTRS pension fund gained 20% in the last fiscal year. The SBMA payments go to our most senior, mostly women, retirees and can actually be larger than their regular pensions. They truly depend on this money for their survival. The annual 2% increase is not a vested benefit. Should it cease the money in the SBMA would be critical to compensate members from the ravages of inflation. SBMA must continue to be protected. Eventually the teachers will learn that the laws of physics also apply to them …. that what goes up (the benefit levels) must come down. Or they’ll eventually get nothing……..
Google for the current status of the Police and Fire Pension Plans in Central Falls, RI for a possible look in the future of many CA Plans. Reilleyfam, ….. Can the “California Courts” also print money when the funds run out ? What makes Civil Servants so “special” ? On another bender today, TL? California pensions aren’t funded by individual, small cities like Central Falls or even Prichard, Alabama. They are generally pooled risk participants in either CalPERS or CalSTRS. Therefore, the boogie-man risks you like to present simply don’t occur in this state. Although California courts certainly can’t print money, as you well know, they can issue and enforce orders for cities and pension funds to comply with existing law. That means the pensions will be paid even before bond debt, so you shouldn’t wish so fervently for a default on either. Finally, the fact that many private retirees do not receive COLA increases in their pensions may or may not be true. Either way, it is not the deal that the state and/or its cities and counties made with its public employees and teachers, so your point is irrelevant. Civil Servants aren’t particularly special, as you so often like to suggest. They are just receiving the deferred compensation for which they worked throughout their 30 or 40 year careers as a pension for their senior years. Why would you begrudge the effort to protect them from inflation as they age? Now granted, in might not work in the few very crime-prone areas, but it would be an effective use of limited resource dollars in 90+% of California. As a retired officer, your thoughts ? TL – Every police chief, at least in California, already has a non-sworn boss. That person is either (generally) the City Manager or (less common) a “strong mayor.” It would be nearly impossible for an executive manager to competently direct the activities of what is arguably the most publicly visible government service in any jurisdiction without thorough knowledge and experience in the field itself. Among other things, that individual would not have any level of respect or trust from the officers he/she was attempting to lead. Second, we in California have been “civilianizing” as many police functions as possible for at least the last 25-30 years. That’s why you see so many non-sworn crime scene technicians, fingerprint examiners, computer forensics examiners, document examiners, and forensic scientists in police departments these days, none of which are sworn or carry a gun. We used to train police officers to perform these tasks, but that has long been considered as obsolete as using a telephone call box or a single action revolver in the modern era. The other problem with your suggestion is that even if you are correct in your assessment of non-violent or threatening calls for service, you have no real way of knowing in advance just which of those calls are going to be the 5% (I think it’s more like 10%) that require some direct use or preparation to use legal force. There are many “routine” report calls and traffic stops that suddenly turn into violent encounters, and there’s no way to tell how things are going to go until you have an officer on scene. Any decision made on one year market gains or an apparent excess in funding that lasts a few years is a bad decision. The pertinent time period upon which to make decisions is 60 years. If a pension fund is overfunded every year for 60 years, then it truly is overfunded. Unfortunately lots of bad decisions have been made on the basis of fleeting several year high (and low) fluctuations. Governor Wilson threatened to skim pension funds that looked overfunded in the early `90s. One response was pension funds upped benefits in the 1990’s too. So the proper response to this SBMA apparent overfunding should be …. *yawn*. Just let it be. If it is still overfunded 60 years from now, then tweak it. Of course the apparent underfunding of the main CalSTRS fund makes us all want to panic. Some want to break the contracts, others want to pour money into the fund. Most likely everyone is wrong, and just regularly making the 8+8.25% contributions is the `stay calm and carry on’ approach. Meanwhile, someone should to the serious Monte Carlo/Statistical modeling of the fluctuations over 100’s of years and how they influence the fund. Based on similar studies in the DC world, most likely, the DB plans overpromised benefits out of ignorance by the highly paid managers insufficient grasp of fluctuations. Calmly rolling back benefits is a good idea if so. Pete Wilson didn’t just threaten to skim CalPERS funds–he did–and so did Swartzenneggar. I don’t know, whether or not, the funds were ever restored to CalPERS. Good. I’m glad the CalSTRS purchasing power reserve fund appears to be well funded. Its called sound fiscal policy. Have you heard of it before? Public pensions are under assault throughout the United States. Led to believe that retirement costs for government workers are out of control, governors and legislators in numerous states have been moving to cut benefits, narrow eligibility requirements and push new hires into 401(k)-style defined contribution plans instead of traditional and more secure defined-benefit coverage. While it is true that numerous public pension systems are underfunded because of past decisions by policymakers and because the financial crisis harmed the value of pension-plan investments, that does not necessarily mean that the costs of benefits are excessive. The annual taxpayer cost of funding the retirement benefits of current California public employees belonging to the two main state administered public pension systems (Annual employer normal pension costs = $6.8 Billion) is only 70 percent (70%) of the cost to the state of economic development subsidies and corporate tax breaks and loopholes (Annual cost of corporate subsidies and tax breaks/loopholes = $9.7 Billion).